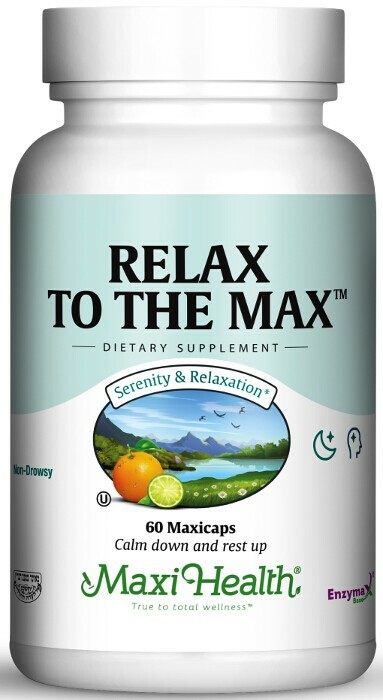 Relax to the Max™ is formulated with Inositol, l-theanine, l-taurine, and other important nutrients to provide you with relaxation support without drowsiness. Inositol is present in all tissues of the body, with highest levels in the brain. It supports the nervous system. L-Theanine promotes alpha wave generation in the brain. We at Maxi Health Research® use the Suntheanine® form of l-theanine which is 100% safe with no known drug interactions, side effects or any limits. Vitamin C, l-glutathione, and l-taurine are included to support against stress hormones. Try Relax To The Max™ today! Take two (2) Maxicaps™ up to three times daily, or as directed.